A drainage system carries gray water and sewage out of the home. To keep the lines flowing freely in the city of Poway, it is important to hire Twin Plumbing to carry out regular drain cleaning. Unfortunately, a lot of individuals disregard cleaning their drains until they backup and cause damage. 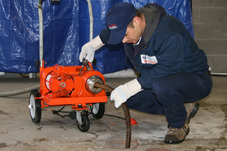 Clogs do not occur only in drains that lead directly from plumbing fixtures, they happen in large sewer lines as well. The plumbing fixtures are attached to the lines that run under the home and then into the yard. They can be easily blocked by tree roots and this could lead to a severe sewage backup, typically through drains that are in the lower level of the home. This issue is quite serious, particularly for individuals who reside in older neighborhoods where there are trees with far-reaching, long-established rooting systems. Serious destruction can result from even a simple clogged sink. Typically, water damage from a clogged drain or flooding is not covered by homeowner’s insurance. For this reason, it is essential to have Twin Plumbing unclog the drain quickly, regardless of how minor it appears to be. It is always best to take preventative measures to keep all plumbing lines and drains flowing freely; therefore, discuss a contract for drain cleaning and preventative maintenance with your plumber. It is important to have regular expert inspections from a professional with the proper tools and equipment to take care of existing and potential issues before they turn into a major disaster. This can save a great deal of money and prevent immense inconvenience. Contact us for a FREE Drainage Inspection! This is an early sign of bad things to come. This occurs most often when a sink line is connected with a washing machine line that is built up with mineral and soap deposits. These deposits line the wall of the drain piping and restricts the flow of waste. Solution : It is less expensive to sewer cable the line before it stops up completely. We can locate the problem line in a few minutes and then run our snake through to remove the build up. The slow, gurgling or low bowl water level toilets are often persistent problems in many homes. These things are often caused from soil and waste water partially filling the sewer line under the house. Things are draining, but not like they are suppose to. This is because the sewer water in the piping does not allow for free flow of vented air in the system. This causes air locks where columns of water are pushing against pockets of trapped air. The bottom line is that the sewer doesnï¿½t flow, instead it seeps, it gurgles and it stops up. Solution : These problems are often misdiagnosed. In fact, unnecessary sewer and drain replacements have been made when it was merely a matter of repairing one section of the sewer or drain line. Call us for a fast, expert diagnosis. This happens all the time. Over the years, we’ve pulled about 200 kids toys from toilet bowls. Solution : We can usually get them out within the first hour. During the holidays, we use the toys for Xmas presents. (just kidding) If you call right now for service, you’ll get $20.00 off the next service call. Just ask for the $20.00 Xmas certificate. (this is how we check to see if anyone is reading our site). There are many causes of sewer smells. They are most commonly caused from traps that have dried out, like floor drains or sinks and fixtures that are seldom used. But we have often found poor workmanship where open vents were left in walls or vents connected to the wrong part of the drain system. Solution : Whatever the source, it must be found, and we can find it. Sewer gas can cause poisoning that can lead to all sorts of ailments, including headaches, insomnia, irritability, and vision problems. In rare cases, the gas can pocket and cause an explosion. It its methane gas, it’s nearly as flammable as natural gas.